Instant Pot Frittata Breakfast Casserole is crazy delicious and loaded with healthy veggies. This tasty pressure cooker breakfast is easy to make and an excellent make-ahead option as well. We adore it! Welcome to the hardest to name recipe of my entire existence. In a fit of indecision and minor foodie identity crisis, I went ahead and labeled this veggie-flecked deliciousness a frittata. I contemplated calling it a crustless quiche but is that not the biggest oxymoron ever? Quiche by definition is allllll about the crust! And of course this bad boy has all the makings of an epic omelet, but with no flipping or folding needed. Alas, this pressure cooker breakfast came out round, fluffy, and frittata-like so gosh darn it, let’s make a frittata! Frittata is more fun to say anyways. Name that movie and you’re my hero. Whatever you call this Instant Pot breakfast situation, I’m certain that OMG YUM is going to follow it because holy cow it’s AMAZING! In just a few short weeks I’ve managed to make this tasty frittata at least four times already, and totally see it becoming a weekly tradition around here. I’ve teamed up with the folks at Nellie’s Free Range Eggs to become a brand ambassador for their tasty free range eggs and share this brunch-worthy egg recipe today! I’m excited to join their flock of families, farmers, and hens and share some crazy delicious breakfast, brunch, and brinner recipes with y’all this year! Their tasty Certified Humane® eggs come from small family farms with ample room, shelter, and no cages whatsoever. They have ready access to the outdoors and fresh grass. I’m so crazy impressed with this company and their dedication to the Humane Farm Animal Care Program. Stay tuned to see what we cook up together next! 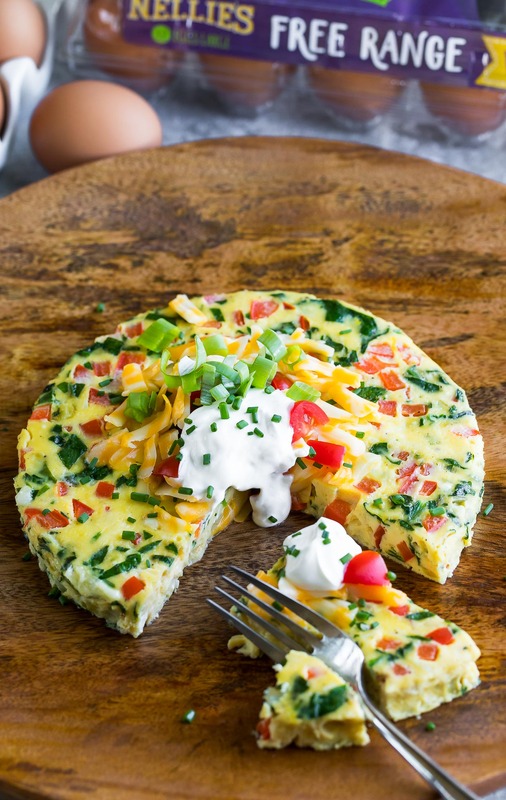 This crazy flavorful Instant Pot frittata is loaded with healthy goodness. I kept things vegetarian and added bell peppers, onion, spinach, and cheese with a little cheesy chive action happening on top for good measure. You can even top it with a dollop of sour cream or Greek yogurt if you’re a fan! You’ll spend maybe 10-15 minutes chopping, whisking, and sautéing then simply pour it in a bowl, toss it in the Instant Pot and LEAVE THE KITCHEN! No babysitting a pan on the stove or waiting ages for it to bake in the oven. I can set it and forget it and then finish getting myself and my daughter ready for work/school while a hot and delicious breakfast basically cooks itself. It can even be made in advance and warmed up the following morning! 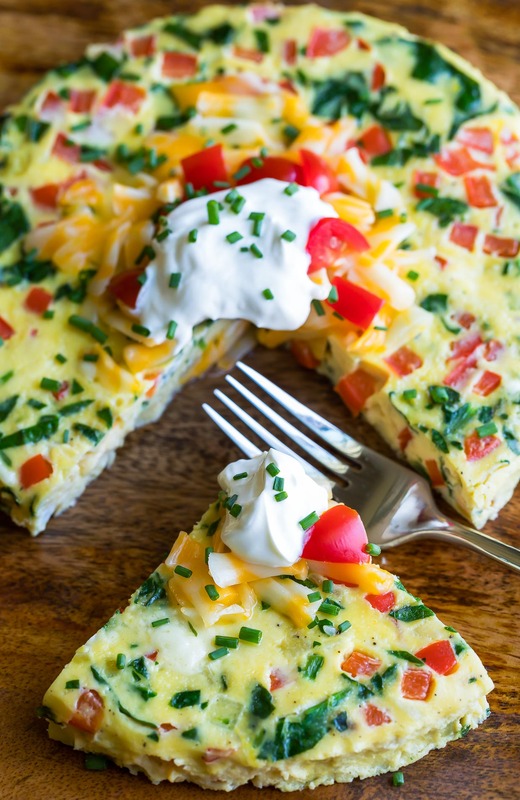 This tasty frittata serves 2 large portions or 4 smaller servings to pair with fresh fruit, hash browns, and all your breakfast favorites. OPTIONAL TOPPINGS - choose your favorites! Spray your 7x3 dish/pan very well with cooking spray (avocado oil spray is my favorite). You can also rub the entire pan with butter if you prefer - just make sure to make that bad boy stick proof or you’ll be eating scrambled eggs for breakfast instead, lol! Cut a circle of parchment paper to line the bottom of the dish for extra easy removal. <-- I do this and love it! Crack eggs into a large bowl, chop your veggies, and measure out all your ingredients. Use an egg beater or whisk to whip your eggs until yolks and whites are fully incorporated. Next whisk in heavy cream. Season with salt and pepper and add your cheese. Set aside. Turn your Instant Pot on to sauté function and heat 1 tsp oil. Sauté onion and pepper until tender, adding garlic and spinach at the very end. Cook for an additional 30-60 seconds then scoop out the mixture and add to your prepared baking dish. Turn IP off. Give the insert a quick rinse on the inside to remove any stubborn veggie bits left behind, then return to your IP and add 1 cup water. Top with a handled trivet (I use the one my IP came with - super convenient and it has handles!) and, if yours does not have handles, feel free to make a makeshift handle/sling with folded aluminum foil. Whisk again to mix, then pour egg mixture into your baking dish. Place on top of trivet and lock the lid. Set to 6 minutes high pressure and make sure vent is in the sealed position. Once it beeps, allow a natural pressure release for 10-12 minutes before unlocking the lid. Open the lid, patting the top of the frittata dry with a paper towel as needed. 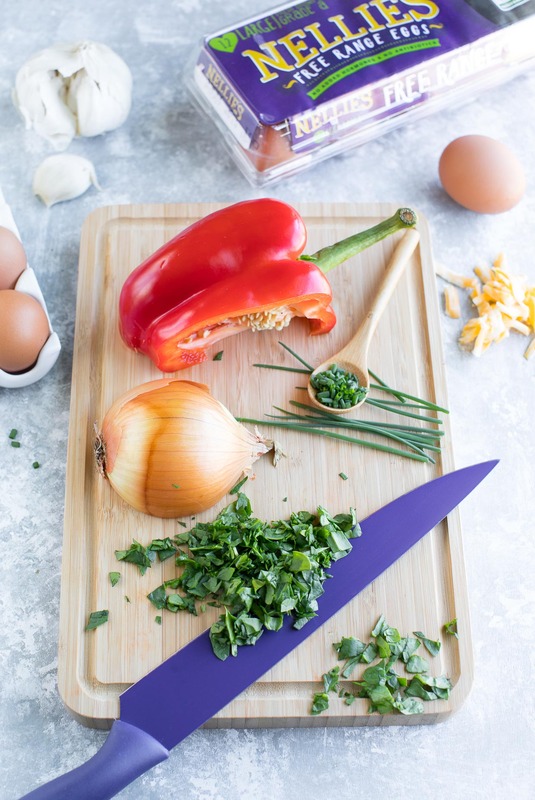 Run a knife along the side to release, allow to cool slightly (it will shrink away from the sides as it cools), then turn it over onto a plate or serve it straight from the bowl by cutting and removing slices with a pie server. If desired, you can add toppings like I did! I love my frittata topped with an extra sprinkle of cheese! While you can absolutely change the types of veggies used and mix-ins in this recipe to your liking (for example bacon/sausage in place of some of the bell pepper or chopped portobello mushrooms in pace of spinach) you don't want to change anything too drastically or the timing will be off. Cooking the egg mixture in the IP's inner pot instead of pot-in -pot, for example can lead to a burn notice and automatic shut-off. if you want to make any swaps feel free to shoot me a comment below and I'll be help you out! This recipe takes approx. 15 min prep time, 6 minutes cook time, plus additional time needed for the Instant Pot to come to pressure and release pressure. My 6QT pot takes 7 min to come to pressure and 10 minutes to release. The bulk of the time is completely hands off and fuss-free - WOOT! Want to serve 4-6 with a larger breakfast casserole? See the notes below this post. Nutrition Facts below are an estimated before toppings using an online recipe nutrition calculator. Adjust as needed and enjoy! Since this serves 2-4 it will be 480 calories each for 2 servings or 240 calories each for 4 total servings. If you get a chance to try this scrumptious Instant Pot Frittata Breakfast Casserole, let me know! Leave some love in the comment form below or tag your photos with @peasandcrayons on Instagram so I can happy dance over your creation! Can I double this instant pot breakfast for two? Kind of! The PIP (pot-in-pot) method of cooking in the instant pot is great because it prevents accidental sticking and burning and has crazy easy clean up. The only down side is that you can’t make a jumbo batch of anything due to the size constraints of the 6-quart pressure cooker. I ran a few test batches of this Instant Pot frittata and successfully made a larger version of this breakfast that yields 4-6 servings; basically 4 large slices or 6 smaller slices to pair with fresh fruit and hash browns. 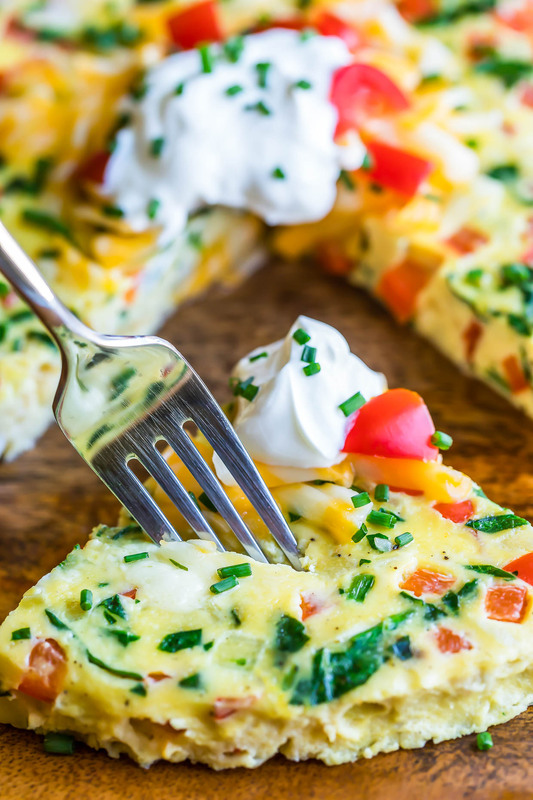 Whether you call it a breakfast casserole, frittata or quiche, this garden veggie breakfast is going to rock your morning! Feel free to make this a day in advance for easy peasy breakfast that tastes amazing warmed up on a busy morning. You’ll use the same 1.5 quart round baking dish as the frittata recipe above. Follow steps in the recipe card above. Cook time will be 30 minutes high pressure. Allow a natural pressure release for 10 minutes before flipping the valve to vent. Release any remaining pressure and, once pressure valve has dropped, remove the lid. See recipe card for detailed instructions. This Instant Pot Frittata Breakfast Casserole recipe post is sponsored by Nellie’s Free Range Eggs as part of a delicious ongoing partnership! Stay tuned for more egg-cellent recipes to rock your breakfast game! THE QUOTE IS FROM THE LION KING!!!! Okay, now that I’ve got that out of the way, I have a question: do you think you could make this in only the instant pot? I have the smallest version and it definitely won’t fit a baking dish. I know the presentation wouldn’t end up as perfect, but do you think it would work? Thanks in advance! Love this recipe! Lion King FTW! Hey Leeza! So the the Instant Pot typically needs 1 cup of pure liquid (usually water) to do all it’s steamy pressure cooking magic but if you add additional liquid to the egg mixture the result going to be a really watery flavorless mess, eek! I’ve seen some recipes call for just taking the frittata/quiche mixture and putting it right in that IP inner pot and they’re usually followed by tons of comments complaining that it stuck to the bottom and burned – I def don’t want that to happen to you! I think in this case the oven would be best for the casserole? Thoughts? Hi Jenn – I made this with some modifications I thought I’d let you know about. I am a “one dish whenever possible” kind of person so I used a 7″ Anchor Hocking (my fave glass company because their products are all made in the USA – the main plant is in Lancaster, Ohio – near my hometown) storage bowl. Because I hate raw egg all over, or to clean up even cooked egg from a dish, I lined the entire thing with parchment paper. I put chopped onions, diced ham (don’t cringe…just might be other omnivores like me searching for IP fritatta), mushrooms and some cheese in it then cracked 4 eggs right on top with pepper and tobasco sauce (my husband is low salt), stirred it all together and cooked per your instructions. Topped with salsa it was delicious!!! The only raw egg thing I had at the end was the fork! One thing I would change in mine is that being lazy I wanted to see how the onions did not sauteed. Yeah, they need a little sauteing. But the mushrooms and ham were FINE. The heat while cooking the egg was more than enough to do them well…and I would recommend sauteing for any peppers. But mushrooms and diced ham would not need sauteing. My way I only had that one fork with raw egg and zero clean up in the bowl. It might not be worth all the parchment paper and I may try spraying the bowl then just lining the bottom because the IP cooks so differently, I’m not sure one would have any glommed on egg after cooking. Those are my inputs. Thanks for this recipe…and I also highly recommend people making a sling with aluminum foil to lift this out onto a towel so you can then carry it with the towel to where you need. Sorry to ramble on here!! But it might be worth a side note in your article, or trying your own experience to see about mixing the eggs right in the cooking vessel. I HATE raw egg in my sink or dishwasher!! This sounds so yummy! Do you think that I could use an instant pot springform pan for this? Hi Brandi! Ok so I’ve totally tried this and what happened with mine is that some of the egg mixture snuck out of the bottom of the springform but I was able to tightly wrap the outside with foil so I didn’t lose too much. Thanks so much! That’s what I was worried about. I will try the foil! I’m on Weight Watchers, so I made these modifications; I subbed evaporated fat free milk for the heavy cream, and 75% reduced fat white cheddar for the regular cheese. I sautéed the veggies in a small nonstick skillet, misted with olive oil spray, so I omitted the 1 tsp. of olive oil. This was FABULOUS and very filling! I ran my modified ingredient list through the WW recipe builder, and for two servings it calculated to 3 Freestyle Points. Definitely a keeper I will make and enjoy many times more! Ahhh yay! Thank you Elaine! Super stoked you enjoyed the recipe and I’m loving that you were able to tweak it to fit your lifestyle and come up with just 3 Freestyle Points per serving, awesome! Looks delicious! Just making sure I do not manually pressure release the instantpot. The instructions state *Once it beeps, allow a natural pressure release for 10-12 minutes before unlocking the lid. * so do I release the pressure myself? What if I use a whole red bell pepper and a green bell pepper? Movie reference = Lion King! This recipe looks amazingly good. Definitely going to give it a try. What kind of pot do you use that fits inside the IP? Hi Stacie! I use a CorningWare 1.5 quart round baking dish that has lasted me though so many IP uses! A 7 x 3 inch cake pan could also work for this recipe. This recipe looks amazing–thank you for sharing it! I was wondering if the heavy cream was an absolute necessity? My husband has difficulty digesting dairy, so I’d love to minimize the dairy for this. Thank you in advance! Wonderful, inviting and vibrant ! Thank you ! I’ve just begun cooking with my Instant Pot and was thrilled to find this recipe – it’s so delicious! I love using my Instant Pot for breakfasts and hadn’t done so until I found your recipe – thank you! I am in love with my Instant Pot and U cannot wait to try this! Thank you Jill! It’s for sure an IP perk to be able to whip this up in there with all the other tasty options! 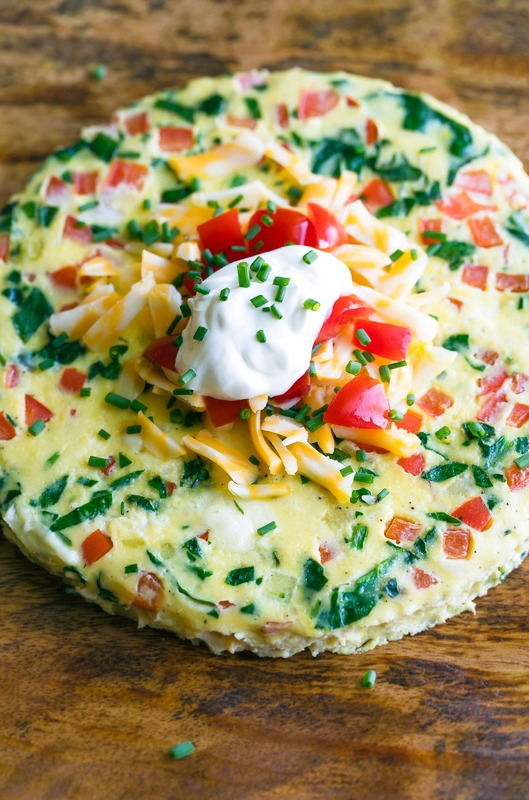 I love using my instant pot and this sounds fabulous that we can make frittata in IP too. Loved the detailed recipe. Thanks Sonal! I love that I can make breakfast so many different ways in the Instant Pot! 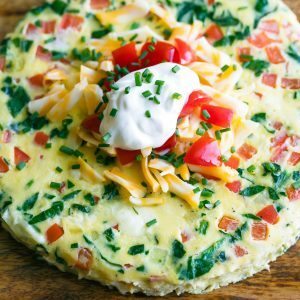 I need to try making a frittata in the instant pot, this one looks so good! Wow! In the instant pot? Game changer! Now I think I’m gonna make frittata for lunch! lol craving it now!